In April 2014 the Digital by Default Service Standard went live, and since then all new or redesigned services have had to be assessed against all 26 points in the standard. Here at GDS we run service standard assessments for the major services (those with over 100,000 transactions a year and all exemplars). This means that GDS will assess over 180 services that together make up over 99% of the total online transactions that people have with government. In October Digital Leaders from across government departments agreed that they would be responsible for assessing, using a panel from their department, services with under 100,000 transactions a year. 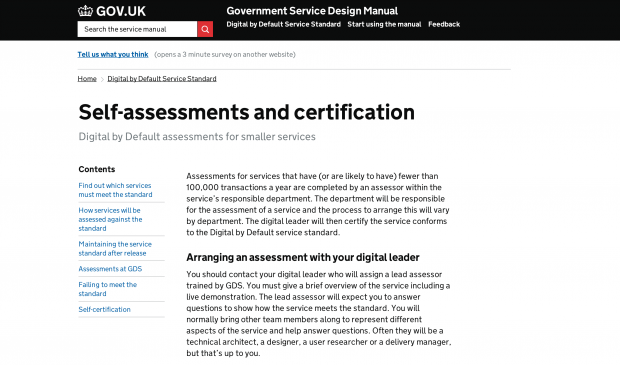 In order for a service to go live on GOV.UK we will ask the relevant Digital Leader to certify that the service has been assessed and meets the Digital by Default criteria. As with the assessments run by GDS, our intention is that the internal assessment teams will do this at each development stage of a service; alpha, beta and live. It is up to each department to manage how they run their internal self-assessments. This will vary depending of the skills and capability of departments, but the criteria against which the services are assessed and the tools that will be used are the same as those we use for the larger services. When departments complete an assessment they will submit their assessment report to the service assessment team here at GDS. This will allow the service to launch on GOV.UK (if it's in beta or going live). This will also be the basis of the report for the service published on the GDS data blog, sitting along side the assessments of the larger services. It’s really great to see services already that have completed a self-certification published on the blog already. Ian Hunter and I from the Transformation Team at GDS recently sat in on the first government DbD self-assessment for the Rod Catch Returns service at the Environment Agency. The process was very successful with the Agency assessment team fully knowledgeable about the assessment requirements and asking all the right questions. We are running the self-assessment certification in ‘alpha’ at the moment. This process and will evolve over time as we learn more about how different departments are approaching self-assessment certification and what support they need. We will work with departments to review and adapt the process, to make sure that it works for them, and that it delivers services which we are all proud to see and use - and we will feed back on what we learn on the way. Thanks to those who have run assessments already, we are looking forward to seeing the variety of services government offer coming through. Follow Tom on Twitter @drtommac, and don't forget to sign up for email alerts. I'd be keen to have a contact for the service assessor training. I've just started a Digital Transformation role in central gov. I've sent you an email with my contact details.